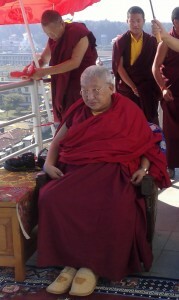 Kyabje Taklung Tsetrul Rinpoche, throneholder of the Dorje Drak monastery, accepted the position of the Supreme Head of Nyingmapa, the “Old Translation Tradition” in Tibetan Buddhism. He is following Kyabje Dudjom Rinpoche, Kyabje Dilgo Khyentse Rinpoche, Kyabje Drubwang Pema Norbu Rinpoche, Kyabje Minling Trichen Rinpoche, and then finally Kyabje Trulshik Rinpoche, who passed away late last year. During the gathering for the 23rd Annual Nyingma Monlam in Bodh Gaya early this year, at a conference of major Tulkus, Khenpos and monks from all the monasteries, a decision was made to find the next Supreme Head of the Nyingmapa and to ask both Kyabje Dodrupchen Rinpoche and Kyabje Tsetrul Rinpoche if they would accept this position. Accordingly, Shechen Rabjam Rinpoche (Shechen Monastery), Dzogchen Rinpoche (Dzogchen Monastery), Kathog Getse Rinpoche (Kathog Monastery), Gyangkhang Tulku Rinpoche (Palyul Monastery), and Khokhyem Rinpoche (Mindroling Monastery), and together with two other Nyingma officials went to Sikkim and approached Kyabje Drodupchen Rinpoche. However, Kyabje Drodupchen Rinpoche declined stating his old age and health precluded him from being able to accept the position. They then proceeded to Simla and approached Kyabje Taklung Tsetrul Rinpoche and after much persuasion, he finally accepted the position.